The state's Department of Natural Resources said it aims to turn over management of the fire to local agencies as early as Thursday. Firefighters have contained 50 percent of a brush fire that spread across thousands of acres in Eastern Washington on Tuesday, shutting down Interstate 90 and forcing a temporary evacuation of a Columbia River town. 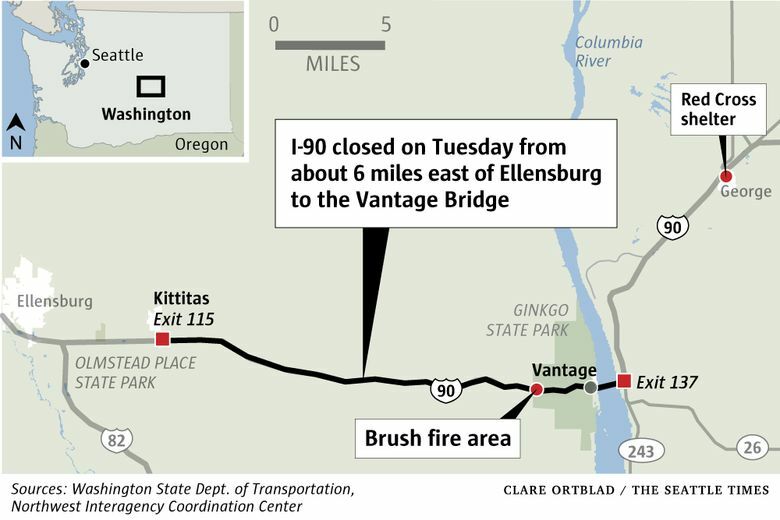 The fire, which has been contained to about 1,600 acres, swept through land near the town of Vantage on the Columbia River on Tuesday, displacing about 200 residents for part of the day and closing a 20-mile stretch of I-90 for 12 hours. The destruction was severe enough to draw the first federal assistance of the state’s wildfire season, one that is off to the swiftest start in five years. It was the first in Washington this year to trigger the highest-level evacuation order and among the first to trigger a road closure, according to the DNR. Hot, dry weather last year contributed to the destruction of tens of thousands of acres, sending smoke and ash across the Cascades and into the Puget Sound region well into September, prompting Gov. Jay Inslee to declare a state of emergency for the state. “This is one of our largest of the year and it’s alarming because it’s only going to get hotter and drier throughout the state,” said Janet Pearce, a DNR spokeswoman. The Federal Emergency Management Agency said in a statement Tuesday that it granted the state the use of federal funds to help with firefighting costs because it judged that “the fire threatened such destruction as would constitute a major disaster.” Assistance may include reimbursement for firefighting expenses and makes the state eligible for an additional $566,667 through the Hazard Mitigation Grand Program. Pearce said the DNR has responded to 506 fires so far this year. That number is higher than it has been in comparable periods over the last five years, she said. It’s about 11 percent higher than by this time of year in 2015, which Pearce said was one of the state’s worst wildfire years in history. Three firefighters were killed and one was critically injured fighting a wildfire near Twisp in Okanogan County in August 2015. Interstate 90 was reopened about noon Tuesday after the wind blew the fire south of the freeway, according to Patrol spokesman Trooper Brian Moore. Residents of Vantage started returning to their homes around the same time. In response to the evacuation of Vantage, the American Red Cross said it had set up a shelter in the neighboring town of George to accommodate displaced residents. There is no way to accurately forecast how bad a wildfire season will be, Pearce said. But based on National Weather Service predictions for more lightning strikes in Western Washington this summer, she expects high fire danger until September. The state has fire equipment and planes staged and ready to go in some high-risk areas, she said. People on both the Eastern and Western sides of the state should take steps to protect their homes, and be cautious with fire-starting materials and campfires, she added. Seattle Times staff reporter Agueda Pacheco-Flores contributed to this report.